The Tranquil Otter is not just any vacation spot. You can relax, watch the wildlife in our private lake, sit on your deck and listen to the birdsong or take a dip in the hot tub to unwind. If you feel adventurous you can walk in our own woodland area or take out a boat and row into the middle of the lake. While outside is bursting with nature and wildlife, inside our lodges you can enjoy contemporary living with the latest technology and modern conveniences to keep you in contact with your loved ones, your workplace or just play games and binge-watch Netflix. All our lodges are beautifully furnished in a modern style that is in keeping with a lodge style property. The kitchens have dishwashers, microwaves, laundry facilities and good quality bed linen, towels, crockery and utensils. If you want to snuggle up in the evening with a roaring fire and good book, you’ll find that all our lodges and the Lough House have log burners. We supply you with logs to get you started and you can purchase more if you need to stay extra cosy. All guests have unlimited access to high-speed WiFi so you can watch, listen, search or surf on all your devices. If you plan to bring a game console or device that does not have signup page, please be aware that it will need to be whitelisted before it can connect to the internet. The connection request is usually only done during office hours. Please let us have the Media Access Control (MAC) address for your device. We have Smart TVs that allow you to log into your Amazon Prime or Netflix accounts and catch up with movies or the latest mini-series sensation. 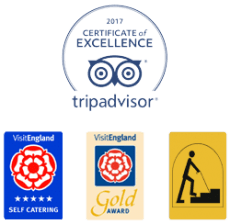 To allow you the feeling of really ‘getting away from it all’, we operate a system where our efficient team works in the background doing everything we can to keep your stay comfortable and enjoyable. If you ever need assistance, we’re happy to help. For more information about The Tranquil Otter or to find out about amazing places to visit in Cumbria, take a look at our ‘Things to Do’ section.